June 3, 2018: As you've heard, and unless something changes, defense lawyers reviewing Michael Cohen's seized papers, documents, emails, and other information for attorney-client privilege issues have been given a deadline of June 15, 2018, a date near the birthday (June 14) and the Solar Return 2018 of Mr. Trump (Sun to natal degree perfects June 13, as you can see). 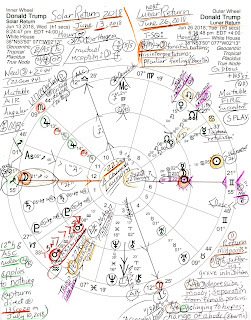 The following post concerns the early part of Mr. Trump's upcoming solar year coupled with his next Lunar Return of June 26, 2018 (21Sag12), plus, a few notes on the activities of transit Jupiter in Scorpio. Previously posted is his May 30, 2018 Lunar Return, ongoing as I type and revealing a very busy month which includes mid-June events such as the deadline noted, above, and the much-hyped 'Singapore Summit' said to be back on the schedule for June 12--unless one or both of the two prima donnas take a quixotic notion to cancel again. Image: Solar Return 2018 (June 13 8:24:47 pm edt, White House) of Donald Trump along with his June 26, 2018 Lunar Return, outer, to show that his natal/Return Moon conjoins the 2018 Solar Return Ascendant (both charts set for the White House for obvious reasons. This cosmic condition spotlights a significant year and prominent month for him. Lunar changes and fluctuations are indicated and possibly a change of job, residence, and/or public status). Also you see that a New Moon conjoins the Descendant in Trump's Solar Return 2018 horoscope which is a generally favorable indicator (unless negatives interfere) and acts as a timer for something new forming--here, in the relationship arena, although legalities may also be involved. Yet a New Moon conjunct DESC suggests potentials for a new cycle for foreign alliances or perhaps a new lady friend for the lonely, needy Mr. Trump. And yes, maybe he'll get out of his self-created legal messes after all--at least partially. But we should also note that the New Moon @22Gem44 of June 13, 2018 conjoins US natal Mars in Gemini and will activate our nation's tiresomely problematic Mars-Neptune square. Leaders who deliberately mislead lurk in the shadows of this New Moon and confrontations with reality prevail. Note that the New Moon is the Syzygy Moon of his 2018 Solar Return and in Gemini the lunation recalls candidate Trump's 'prez bid' announcement of June 16, 2015 @25Gem07--his paid-audience 'escalator' speech at Trump Tower. (Of course, a new cycle for US politics began then too and We the People continue to pay for it.) 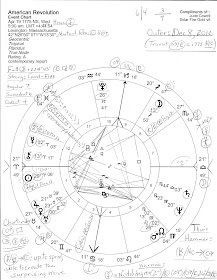 That Mr. Trump's natal Sun sets in his 2018 Solar Return chart may be descriptive of his current condition, plus, we should note that the Moon rules the 8th house of Transition, Corporatism, Shared Resources, Insurance, Credit/Debit, the Occult, and Death so changes are due in those realms as well. As you see, both Return charts are ruled by Jupiter via the Sag Ascendants yet Jupiter applies to no planet in either Return chart which places the emphasis on Jupiter's sign and house positions. Here it's Jupiter in 11th house of Groups and in the big-business/scandal/surveillance-betrayal sign of Scorpio with transit Jupiter turning Direct @13Sco20 on July 10, 2018. Eventually, tr Jupiter will conjoin Trump's natal IC and enter his 4th house from where the planet of expansion will oppose Trump's natal trio of Uranus-NN-Sun. 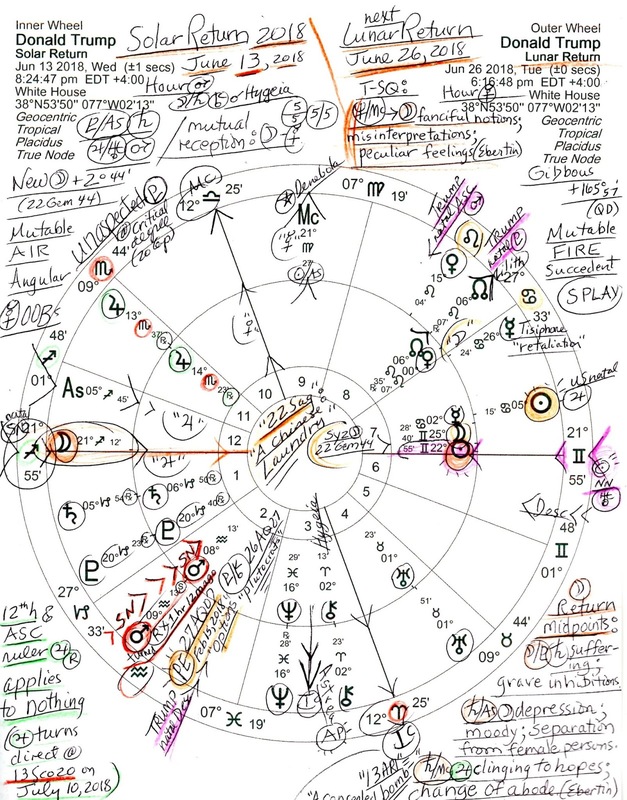 Of course, tr Jupiter to his natal South Node is part of the transit picture too and tacks on potentials for additional blockages, obstacles, ethical problems, and conflicts of interest coming to the surface--as could Mr. Mueller's report if it hasn't already been revealed by February 2019 when tr Jupiter hits Mr. Trump's natal South Node. Prior to entering Trump's 4th house, transit Jupiter must reach and move beyond his shadow degree of 23Sco13 where he (seemed to) turn retrograde on March 8, 2018--stopping short just before conjoining Trump's natal IC (24Sco18) and entering his 4th house. Yet this Jupiterian shift is coming for the broadcaster-in-chief (Jupiter in 4th = expansion, redecoration, or change of residence?) for the first time in approximately 12 years. You may remember that it was in 2006 that real estate (4th house) mogul Donald Trump remarked that he hoped the real estate market tanked and that was about two years before it actually did. Was Trump prescient? Or merely tipped off? 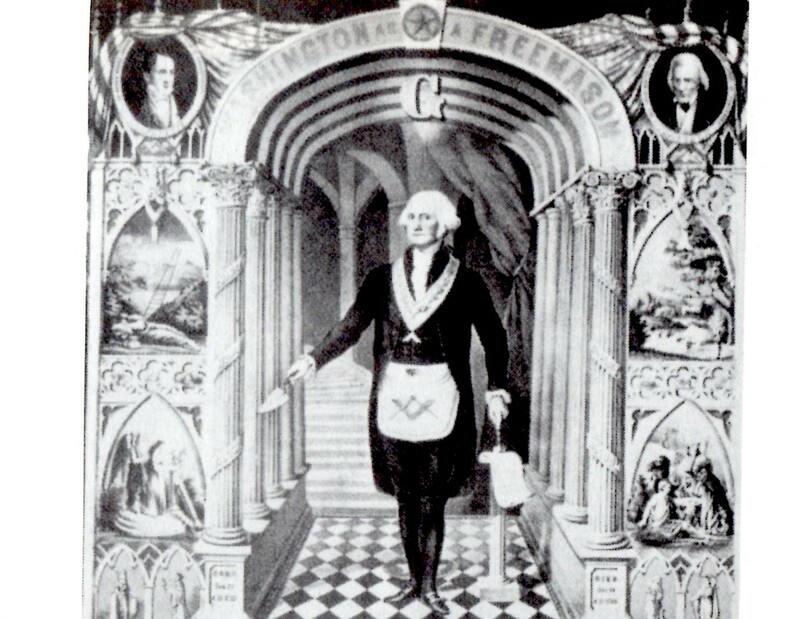 Was he in with the Wall Street in-crowd? 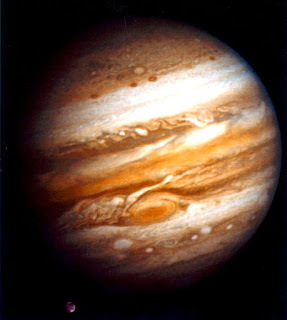 Now it's true that some improvements may be noticed around or just after July 10 when Jupiter turns Direct which involve growth, development, finances, or the promise of them by Jupiterian politicians. Yet before things can really move forward within the realms of Jupiter, the expansive planet of generosity must pass his shadow degree of 23Sco13 where he paused and turned retrograde on March 8, 2018 and this won't occur until October 6, 2018. Then the Great Benefic will be free to conjoin Trump's natal IC--once on October 12, 2018 from whence bossy 'Zeus' will do as he pleases. Does this describe Trump's happy release from White House occupancy and a return to his previous lifestyle? Or will freedom be denied? Perhaps a touch of house arrest?!? Well, another possible indicator should be factored in--the three conjunctions all through 2019 of tr Jupiter to Donald Trump's natal Moon, a 'feel good' transit if there ever was one! But will its soothing vibes be enough to mitigate or moderate the negative implications of other transits to his planets? Factual Saturn and corrupt Neptune may testify otherwise. March 8, 2018 11:45:18 pm EST White House: Jupiter-Saturn = Moon: changing moods; annoyance via females; a changing relationship to a woman; becoming easily upset. Mars-Pluto = Saturn: desire to overcome difficulties and obstacles at all costs; leaving no stone unturned in pursuit of a particular task. Sun-Jupiter = Pluto: expectation of good luck; pursuit of fortune or wealth. Neptune-ASC = Pluto: suffering harm or damage through deceit, libel, or malice coming from others; depression caused by the environment. Uranus-Neptune = Mercury: plans without the possibility of realization; a peculiar imagination (Trump's natal Mercury-Neptune square supplies it); occupation with metaphysical studies or practices; exploration of the unconscious; journeys. October 6, 2018 8:49:44 pm edt White House: Sun-Saturn = Jupiter: a fortunate separation; corpulence and/or a phlegmatic temperament; good fortune of a sick, old, or serious person; happy in solitude. Jupiter-Neptune = Pluto: unreasonable plans; a far-reaching speculation; a great loss. Saturn-Neptune = Mars: listlessness; lack of creative energy; inactivity through emotional depression or illness. Saturn-Neptune = MC: a peculiar character; frequent mood changes; a tendency to quickly lose courage; wavering between materialism and idealism; emotional suffering; the state of illness. Pluto-NN = Mercury: desire to dominate others mentally or intellectually; exercising a compelling and magnetically powerful influence upon the public. Moon-Venus = Sun: actors or stage performers; protective care of the family; marital love. Paraphrasing The Combination of Stellar Influences by Reinhold Ebertin. Related Reading: In the Realms of Jupiter: Donald Trump. Pray all goes well this week.